This is the most frequently requested cake at our house. 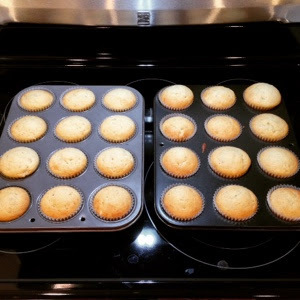 If you are making it as muffins, keep the oven at the same temperature and bake for approximately 15-20 minutes. Remember that the darker the pan, the faster it bakes. Cream together butter and sugar then add eggs. Add vanilla and banana, then dry ingredients and sour cream. Blend. Pour into buttered 9x13 glass pan. Bake at 325° for 35-40 minutes. Cool completely before icing. Melt butter in pan and add brown sugar. Bring to a boil and lower heat to medium low and continue to boil for 2 minutes, stirring constantly. Add milk and bring to a boil. Turn off heat and beat in icing sugar until smooth. Pour over banana cake and let cool before cutting.